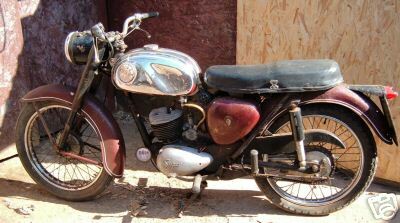 I have been looking for a BSA Bantam motor bike in an original condition to restore for some time. In September 2007 I found a BSA Bantam D7, first registered in 1966 (incidentally the last year of production for the D7) with an engine capacity of 175cc on ebay. The photo here is taken from the ebay page and the Bantam is apparantly a "runner". The Buy It Now price was £450 or Best Offer and I made an offer of £375 which was accepted. The Bantam was located in the New Forest so on Saturday the 22nd of September I set off from Telscombe Cliffs where I live to collect it. I have what I consider to be a good electro/mechanical mind and I have various engineering knowledge and skills but I have never restored a motor bike previously, even so, the restoration project will keep be busy during the winter months and beyond I am sure. When I strip the bike down I am going to do so in a way where I can end up with the minimum number of component parts, and then strip these down and rebuild as and when the projet progresses. Lots or restoration projects end up being hundreds of bits and are never completed. I have also joined the BSAOC (BSA Owners Club) and a Yahoo forum, conducted lots of research and I think that I am as prepared and tutored as I can be at this stage. Hopefully I can seek advice and gain knowledge from others along the way. My garage has been turned into a workshop ready to receive the Bantam, and I can hardly wait to get started. My aim is to retain as much of the original Bantam as possible in my restoration, and complete as much of the work as I can myself. I am not going to restore the bike to an immaculate condition, but it is going to be restored to be ridden.